In 1822 and 1823 Tocal's convicts received a wage set by the Government of £10 ($20) per year. If their master provided clothing, their wage dropped to £7 per year. After 1823 wages were not compulsory but some masters continued to pay, particularly to convicts who were reliable. Often convicts were not paid in cash but in items such as tea, sugar and tobacco, commonly valued from 25 to 35 per cent above the Sydney retail prices. In return for £10 a year in wages, convicts had to work six days a week and up to 10 hours each day. If they refused to work or neglected their work, they were often flogged. [from JD Lang, An Historical and Statistical Account of New South Wales as a Penal Settlement and as a British Colony, 2nd edit, 1837]. 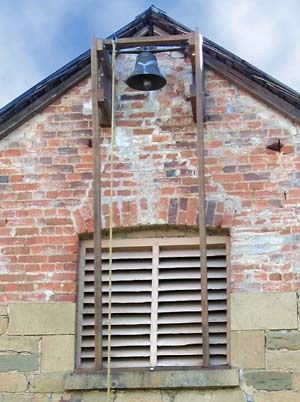 Right: the bell on the end of Tocal's stone barn was used to call convicts to meals.